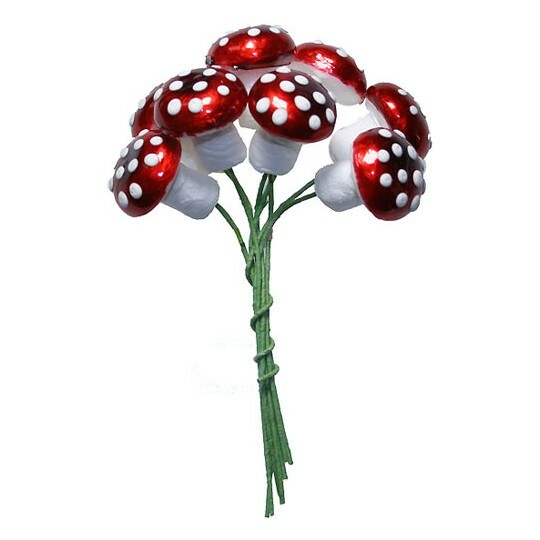 Our selection of mushrooms are perfect for creating ornaments, adding to woodland scenes, embellishing floral bouquets, attaching to the branches of Christmas trees and more. 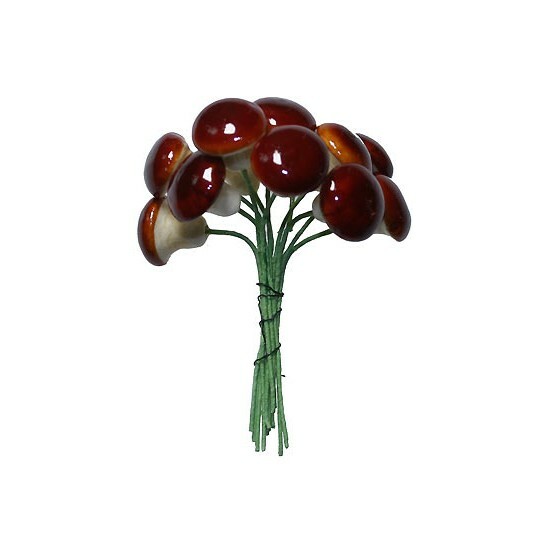 Made from lacquered spun cotton or lacquered composition, we stock both contemporary and vintage styles of these much-loved little mushrooms in a range of sizes. 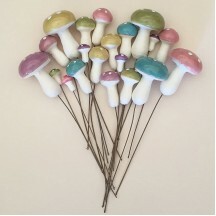 This is a mixed set of 20 spun cotton mushrooms in Pastel Mix. Included colors are light pink, mustard yellow, green, blue and purple. 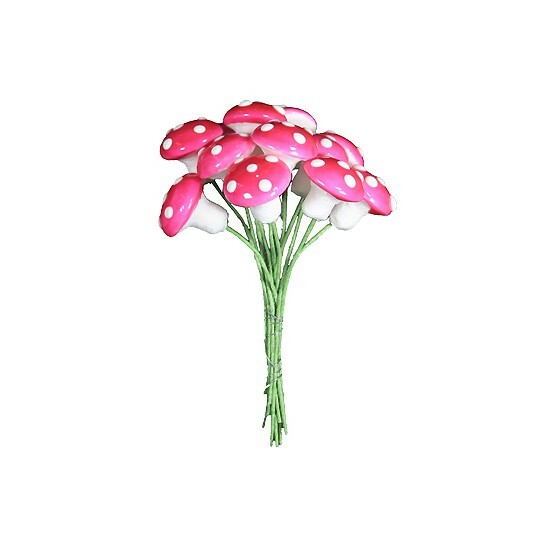 There are 5 large mushrooms measuring 1-3/4" tall, there are 10 medium mushrooms measuring 1-1/4" tall and 5 small size measuring 5/8" tall. 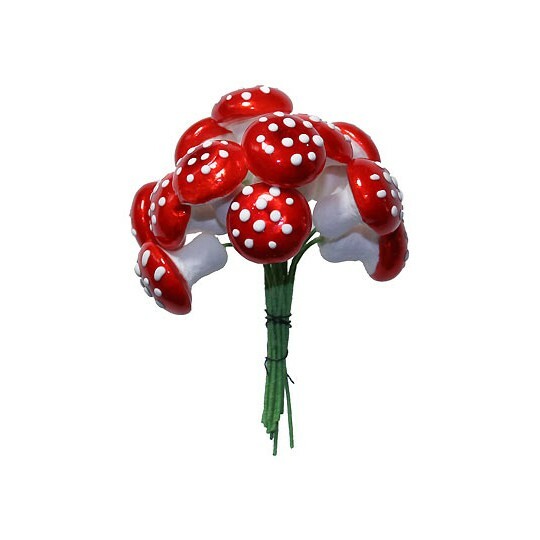 Each mushroom was made by hand and features a lacquered cap with handprinted white spots. Made in the Czech Republic. This is a unique mixed set of 48 spun cotton mushrooms in Rainbow Mix. Included colors are red, pink, yellow, golden yellow, green, blue and purple. 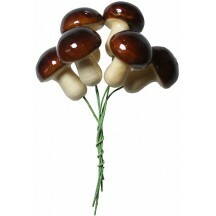 Mushrooms are mostly 10mm and 14mm high with stems measuring 2 to 3-1/2". Each set is unique. 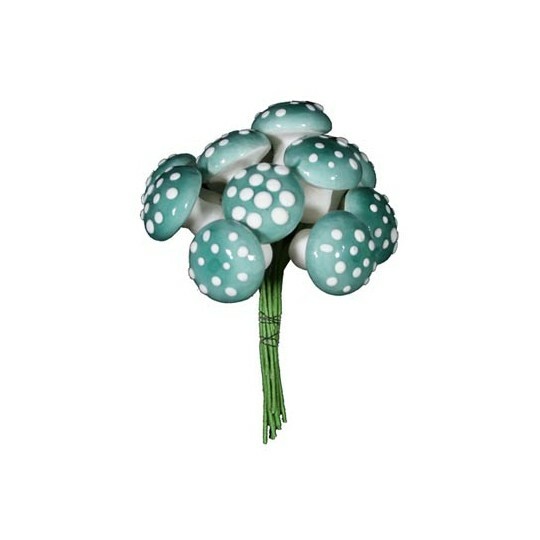 Each mushroom was made by hand and features a lacquered cap with handprinted white spots. Made in Germany. 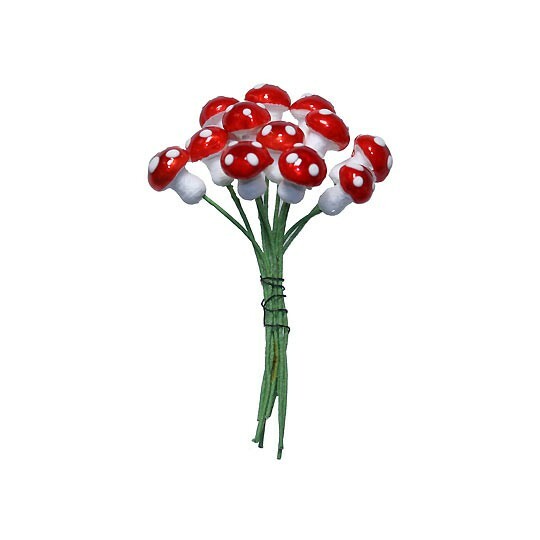 12 spun cotton mushrooms with glossy cranberry lacquered caps and handpainted white spots. 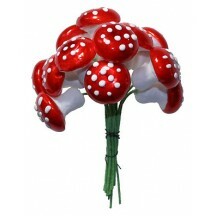 Each mushroom measures 10mm high which is approx. 1/2". They measure 3/8" across the cap and have a 2" green paper covered wire stem. Made in Germany. 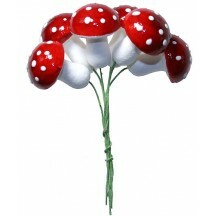 12 spun cotton mushrooms with glossy red lacquered caps and handpainted white spots. 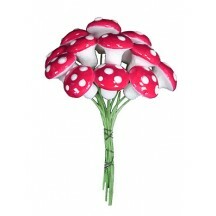 Each mushroom measures 10mm high which is approx. 1/2". They measure 3/8" across the cap and have a 2" green paper covered wire stem. Made in Germany. 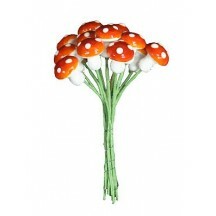 12 spun cotton mushrooms with glossy harvest orange lacquered caps and handpainted white spots. 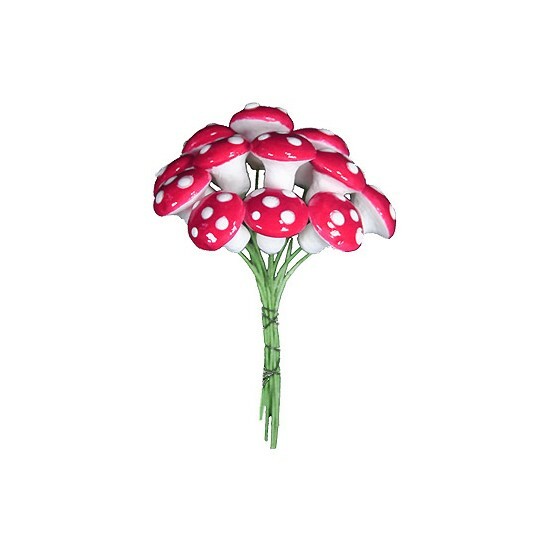 Each mushroom measures 10mm high which is approx. 1/2". They measure 3/8" across the cap and have a 2" green paper covered wire stem. Made in Germany. 12 spun cotton mushrooms with glossy bright pink lacquered caps and handpainted white spots. 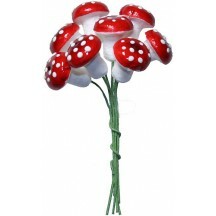 Each mushroom measures 10mm high which is approx. 1/2". They measure 3/8" across the cap and have a 2" green paper covered wire stem. Made in Germany. 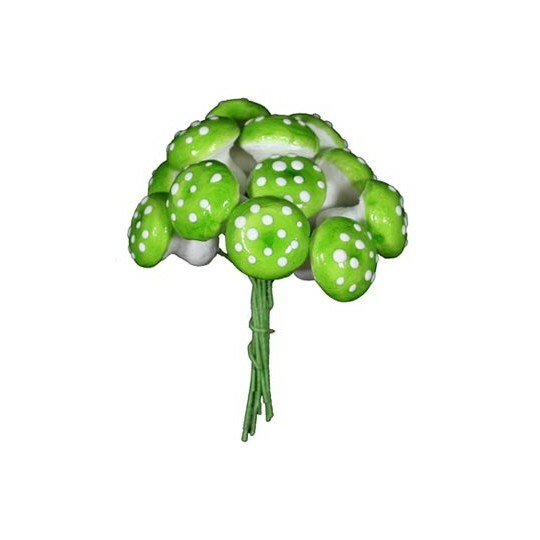 12 spun cotton mushrooms with glossy apple green lacquered caps and handpainted white spots. 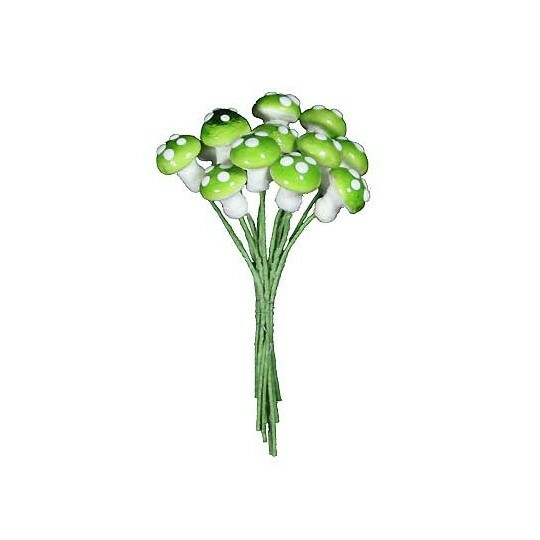 Each mushroom measures 10mm high which is approx. 1/2". They measure 3/8" across the cap and have a 2" green paper covered wire stem. Made in Germany. 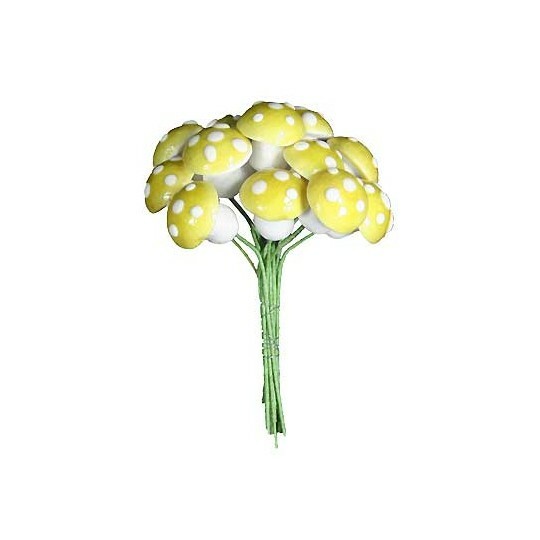 12 spun cotton mushrooms with glossy lemon yellow lacquered caps and handpainted white spots. 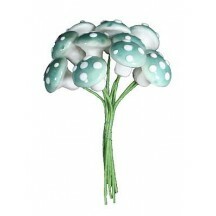 Each mushroom measures 10mm high which is approx. 1/2". They measure 3/8" across the cap and have a 2" green paper covered wire stem. Made in Germany. 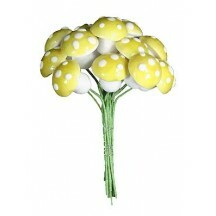 12 spun cotton mushrooms with glossy honey gold lacquered caps and handpainted white spots. 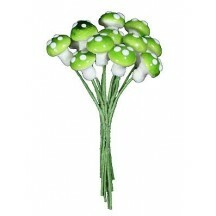 Each mushroom measures 10mm high which is approx. 1/2". They measure 3/8" across the cap and have a 2" green paper covered wire stem. Made in Germany. 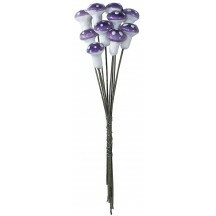 12 spun cotton mushrooms with glossy lilac purple lacquered caps and handpainted white spots. 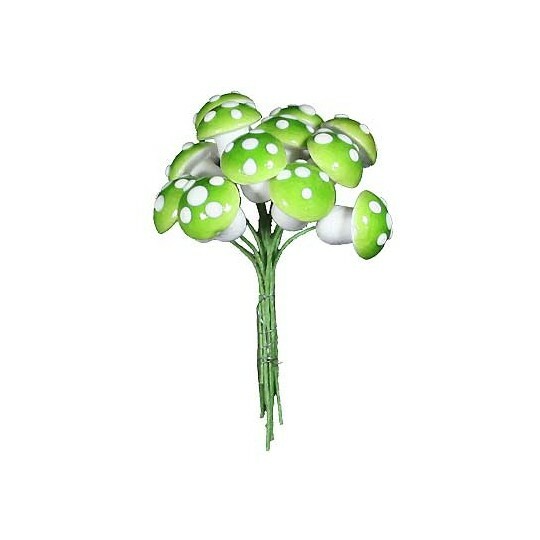 Each mushroom measures 10mm high which is approx. 1/2". They measure 3/8" across the cap and have a 2" green paper covered wire stem. Made in Germany. 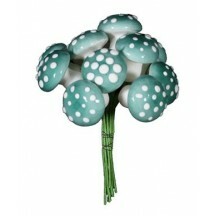 12 spun cotton mushrooms with glossy sky blue lacquered caps and handpainted white spots. 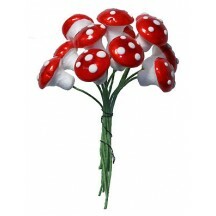 Each mushroom measures 10mm high which is approx. 1/2". They measure 3/8" across the cap and have a 2" green paper covered wire stem. Made in Germany. 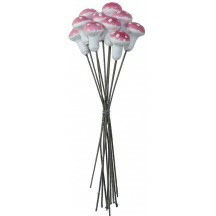 12 spun cotton mushrooms with glossy cranberry lacquered caps and handpainted white spots. 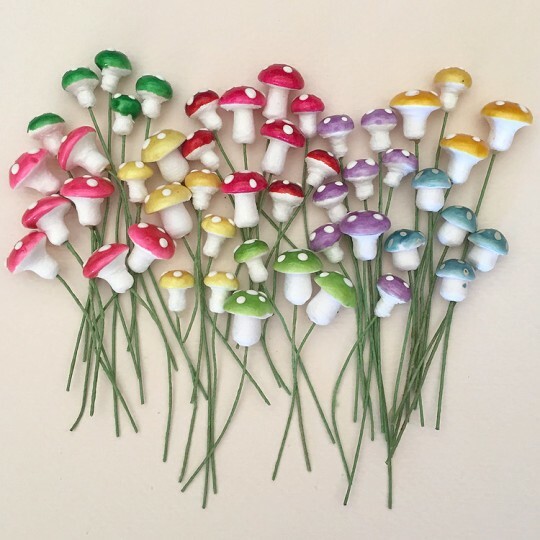 Each mushroom measures 14mm high which is just under 5/8". They measure just under 5/8" across the cap and have a 2" green paper covered wire stem. Made in Germany. 12 spun cotton mushrooms with glossy ruby red lacquered caps and handpainted white spots. Each mushroom measures 14mm high which is just under 5/8". They measure just under 5/8" across the cap and have a 2" green paper covered wire stem. Made in Germany. 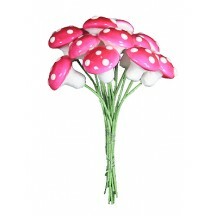 12 spun cotton mushrooms with glossy bright pink lacquered caps and handpainted white spots. 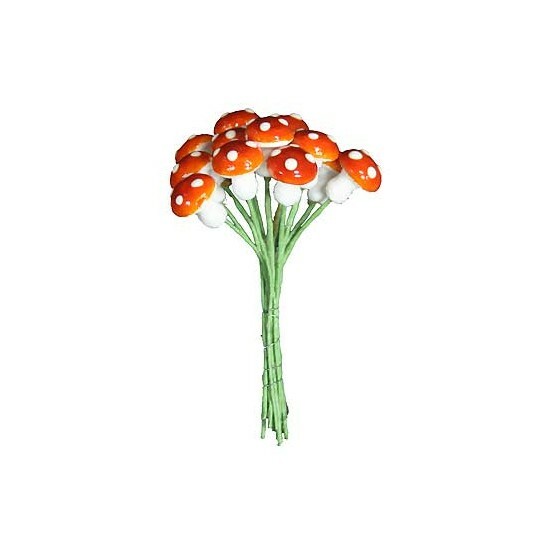 Each mushroom measures 14mm high which is just under 5/8". They measure just under 5/8" across the cap and have a 2" green paper covered wire stem. Made in Germany. 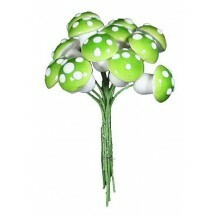 12 spun cotton mushrooms with glossy apple green lacquered caps and handpainted white spots. 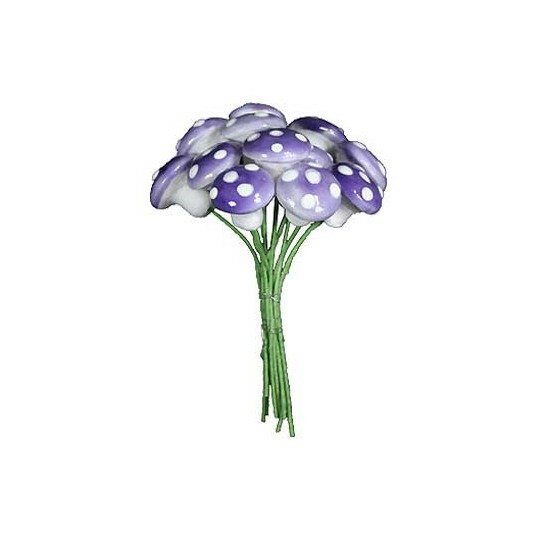 Each mushroom measures 14mm high which is just under 5/8". They measure just under 5/8" across the cap and have a 2" green paper covered wire stem. Made in Germany. 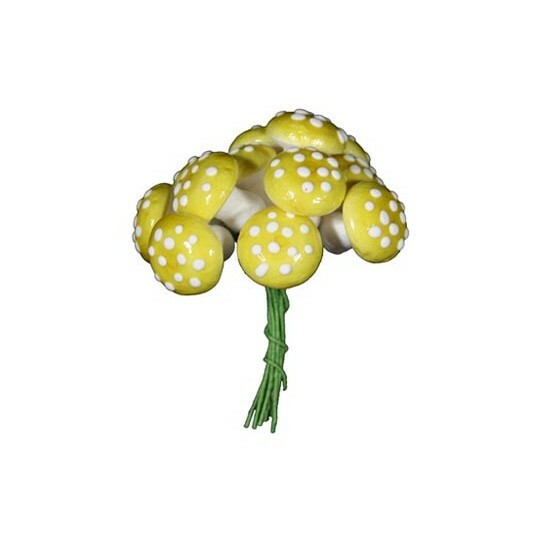 12 spun cotton mushrooms with glossy lemon yellow lacquered caps and handpainted white spots. 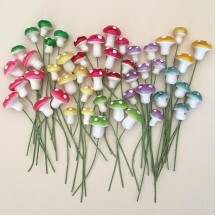 Each mushroom measures 14mm high which is just under 5/8". They measure just under 5/8" across the cap and have a 2" green paper covered wire stem. Made in Germany. 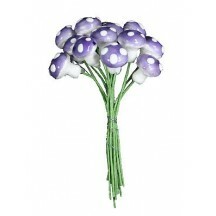 12 spun cotton mushrooms with glossy lilac purple lacquered caps and handpainted white spots. 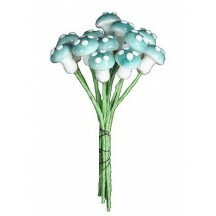 Each mushroom measures 14mm high which is just under 5/8". They measure just under 5/8" across the cap and have a 2" green paper covered wire stem. Made in Germany. 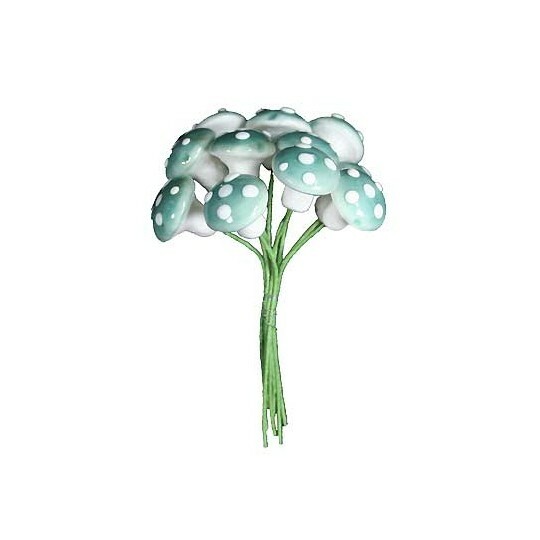 12 spun cotton mushrooms with glossy sky blue lacquered caps and handpainted white spots. 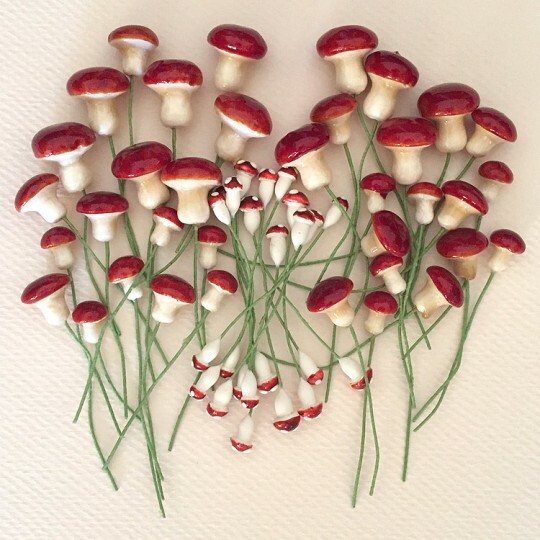 Each mushroom measures 14mm high which is just under 5/8". They measure just under 5/8" across the cap and have a 2" green paper covered wire stem. Made in Germany. 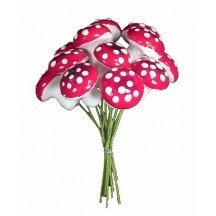 12 spun cotton mushrooms with glossy cranberry lacquered caps and handpainted white spots. 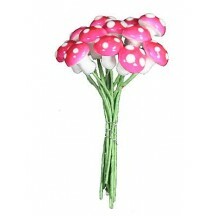 Each mushroom measures 18 mm high which is approximately 3/4". 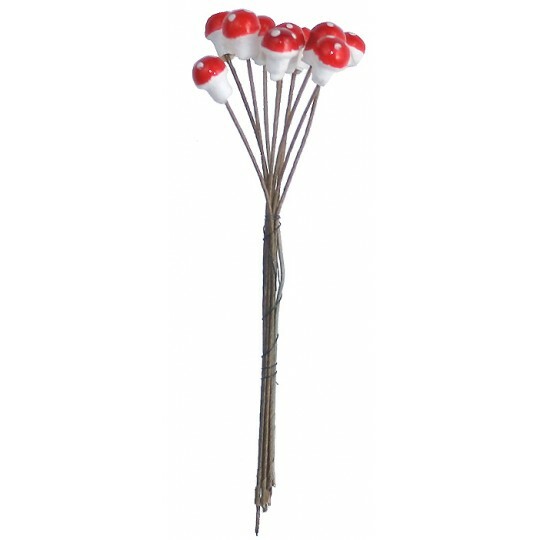 They measure just over 5/8" across the cap and have a 2" green paper covered wire stem. Made in Germany. 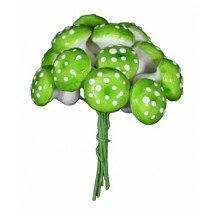 12 spun cotton mushrooms with glossy apple green lacquered caps and handpainted white spots. 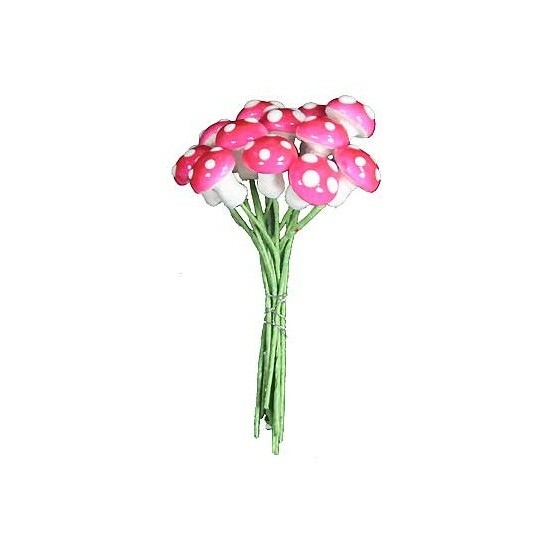 Each mushroom measures 18 mm high which is approximately 3/4". 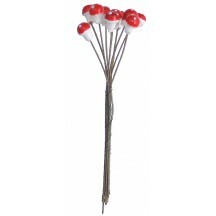 They measure just over 5/8" across the cap and have a 2" green paper covered wire stem. Made in Germany. 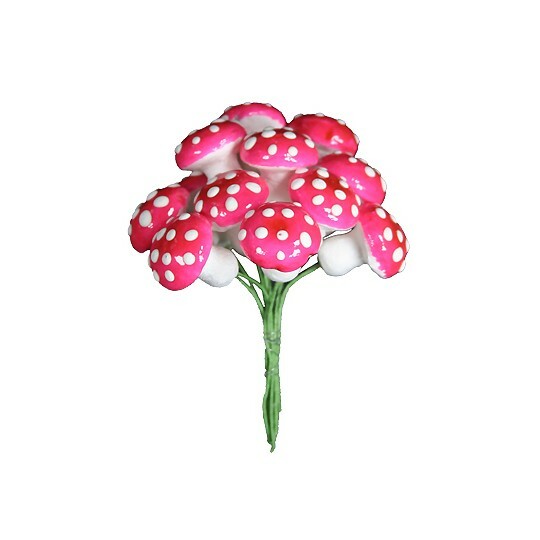 12 spun cotton mushrooms with glossy bright pink lacquered caps and handpainted white spots. 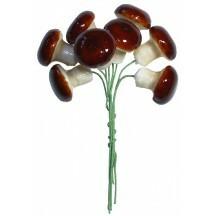 Each mushroom measures 18 mm high which is approximately 3/4". 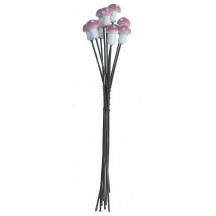 They measure just over 5/8" across the cap and have a 2" green paper covered wire stem. Made in Germany. 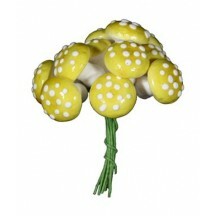 12 spun cotton mushrooms with glossy lemon yellow lacquered caps and handpainted white spots. 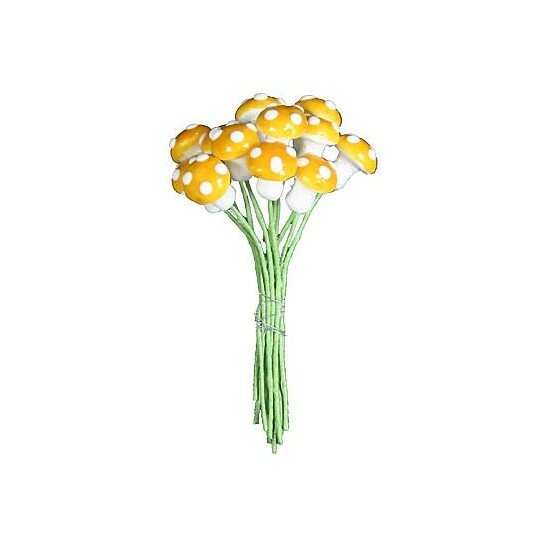 Each mushroom measures 18 mm high which is approximately 3/4". They measure just over 5/8" across the cap and have a 2" green paper covered wire stem. Made in Germany. 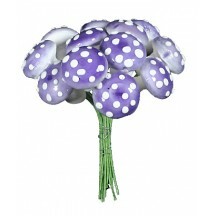 12 spun cotton mushrooms with glossy lilac purple lacquered caps and handpainted white spots. 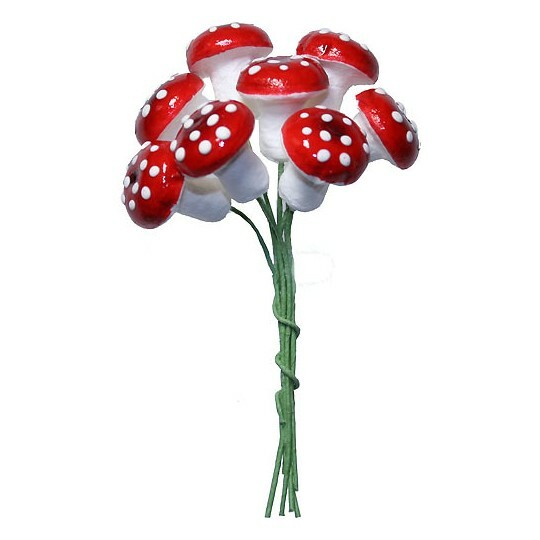 Each mushroom measures 18 mm high which is approximately 3/4". They measure just over 5/8" across the cap and have a 2" green paper covered wire stem. Made in Germany. 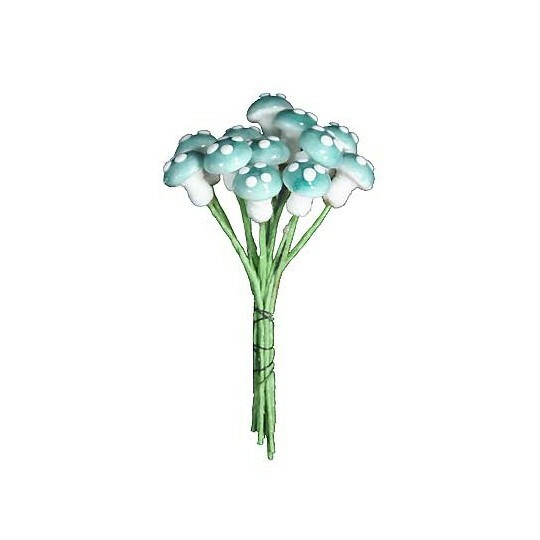 12 spun cotton mushrooms with glossy sky blue lacquered caps and handpainted white spots. 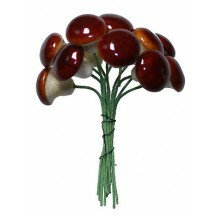 Each mushroom measures 18 mm high which is approximately 3/4". They measure just over 5/8" across the cap and have a 2" green paper covered wire stem. Made in Germany. 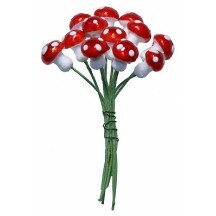 12 spun cotton mushrooms with glossy metallic bright red lacquered caps and handpainted white spots. 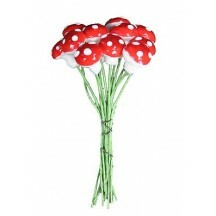 Each mushroom measures 10mm high which is approx. 1/2". They measure 3/8" across the cap and have a 2" green paper covered wire stem. Made in Germany. 12 spun cotton mushrooms with glossy metallic bright red lacquered caps and handpainted white spots. 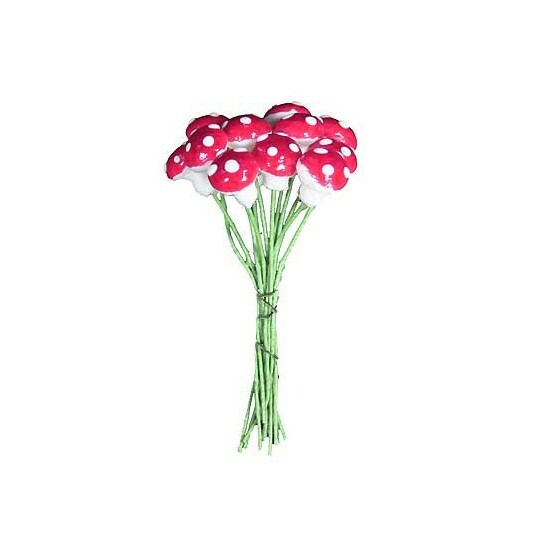 Each mushroom measures 14mm high which is just under 5/8". They measure just under 5/8" across the cap and have a 2" green paper covered wire stem. Made in Germany. 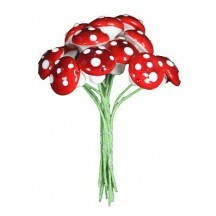 12 spun cotton mushrooms with glossy metallic bright red lacquered caps and handpainted white spots. 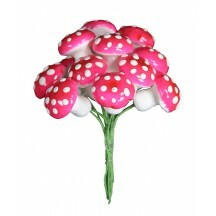 Each mushroom measures 18 mm high which is approximately 3/4". They measure just over 5/8" across the cap and have a 2" green paper covered wire stem. Made in Germany. 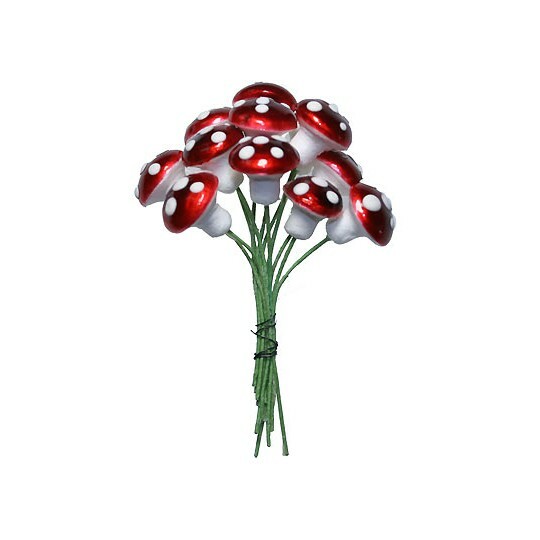 12 spun cotton mushrooms with glossy metallic dark red lacquered caps and handpainted white spots. 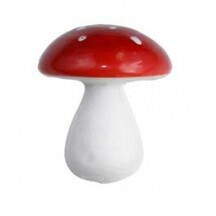 Each mushroom measures 14mm high which is just under 5/8". They measure just under 5/8" across the cap and have a 2" green paper covered wire stem. Made in Germany. 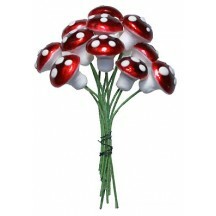 12 spun cotton mushrooms with glossy metallic dark red lacquered caps and handpainted white spots. 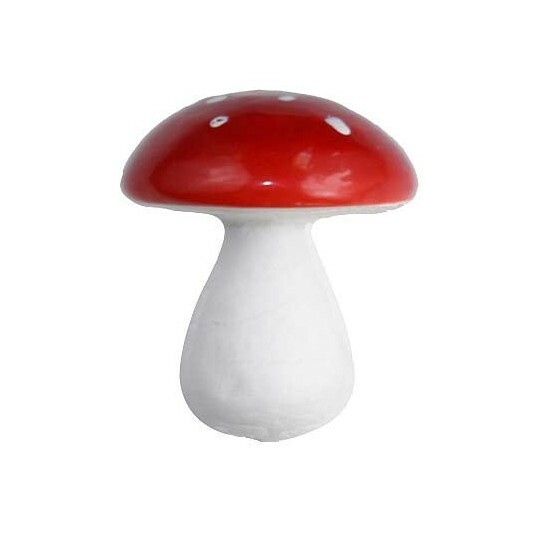 Each mushroom measures 18 mm high which is approximately 3/4". 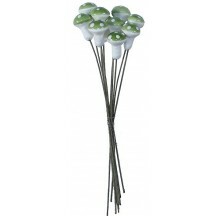 They measure just over 5/8" across the cap and have a 2" green paper covered wire stem. Made in Germany. 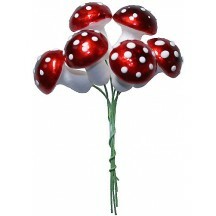 8 spun cotton mushrooms with glossy metallic dark red lacquered caps and handpainted white spots. 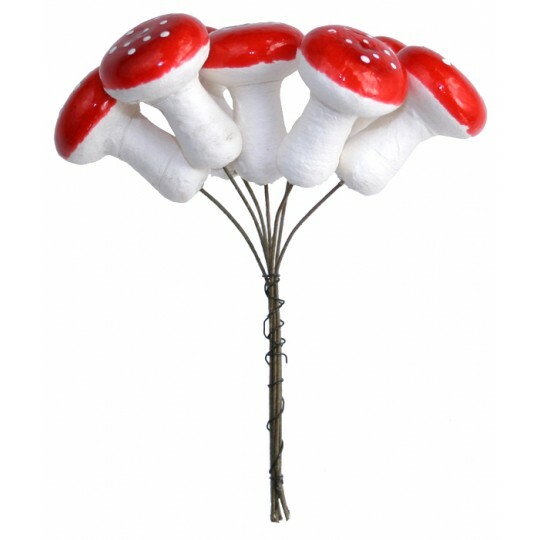 Each mushroom measures 20 mm high which is just under 7/8". They measure 3/4" across the cap and have a 3" green paper covered wire stem. Made in Germany. 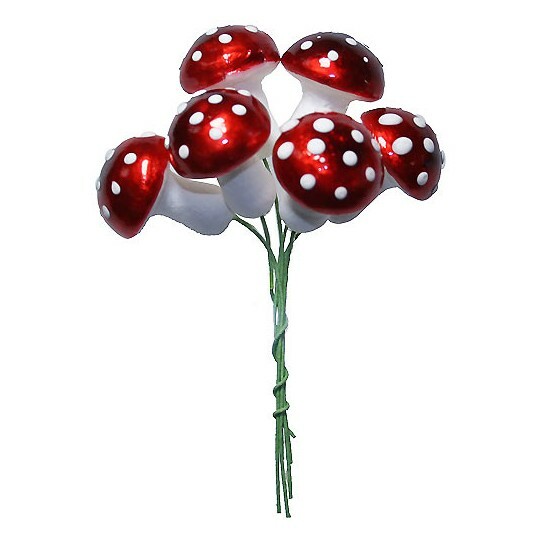 6 spun cotton mushrooms with glossy metallic dark red lacquered caps and handpainted white spots. Each mushroom measures 25 mm high which is approximately 1". 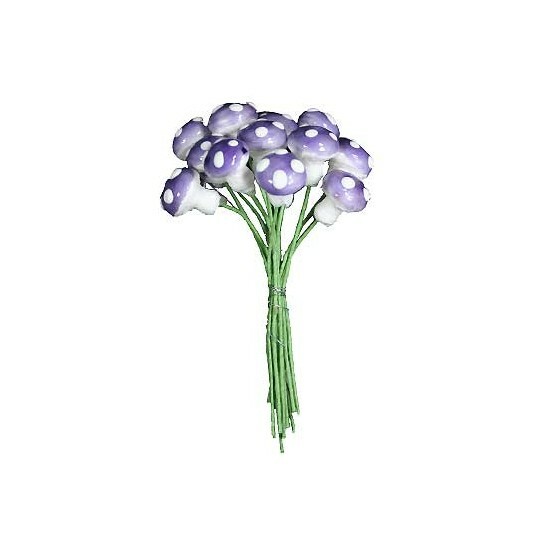 They measure just under 1" across the cap and have a 3" green paper covered wire stem. Made in Germany. 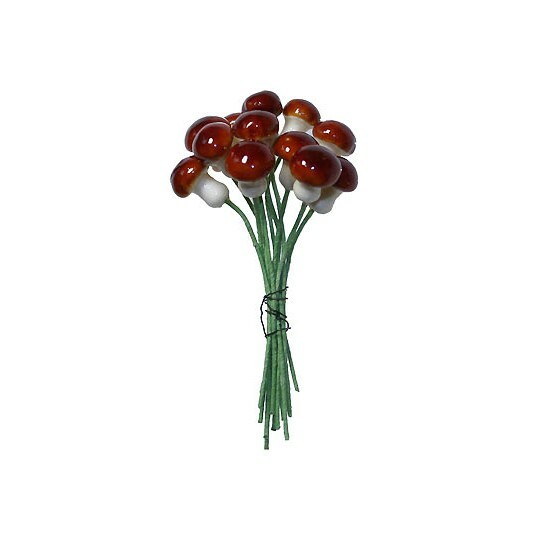 12 spun cotton lacquered mushrooms are glossy all over with brown caps and ivory stems. 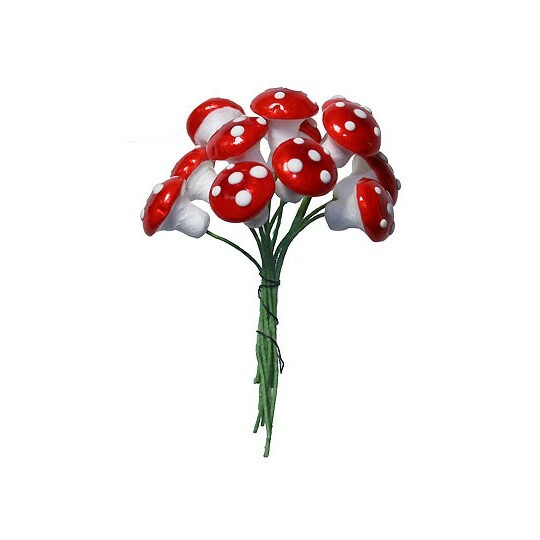 Each mushroom measures 10mm high which is approx. 1/2". They measure 3/8" across the cap and have a 2" green paper covered wire stem. Made in Germany. 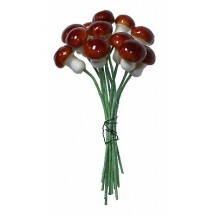 12 spun cotton lacquered mushrooms are glossy all over with brown caps and ivory stems. 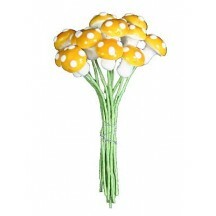 Each mushroom measures 14mm high which is just under 5/8". They measure just under 5/8" across the cap and have a 2" green paper covered wire stem. Made in Germany. 8 spun cotton lacquered mushrooms are glossy all over with brown caps and ivory stems. 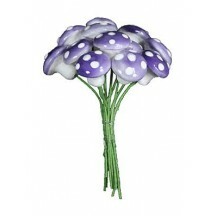 Each mushroom measures 20 mm high which is just under 7/8". They measure 3/4" across the cap and have a 3" green paper covered wire stem. Made in Germany. 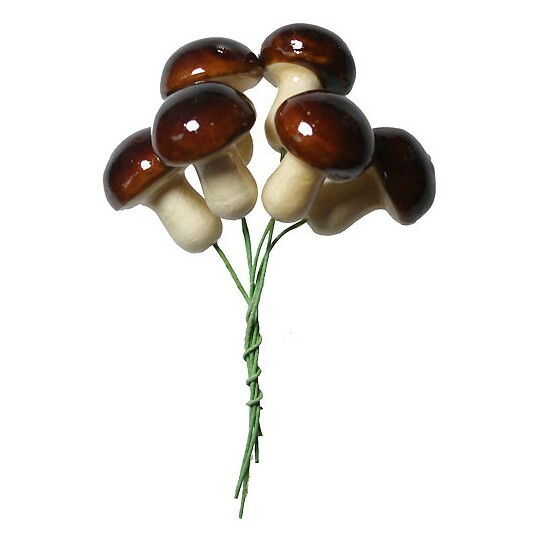 6 spun cotton lacquered mushrooms are glossy all over with brown caps and ivory stems. 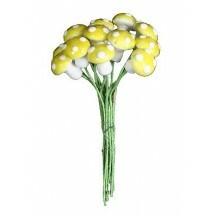 Each mushroom measures 25 mm high which is approximately 1". They measure just under 1" across the cap and have a 3" green paper covered wire. Made in Germany. 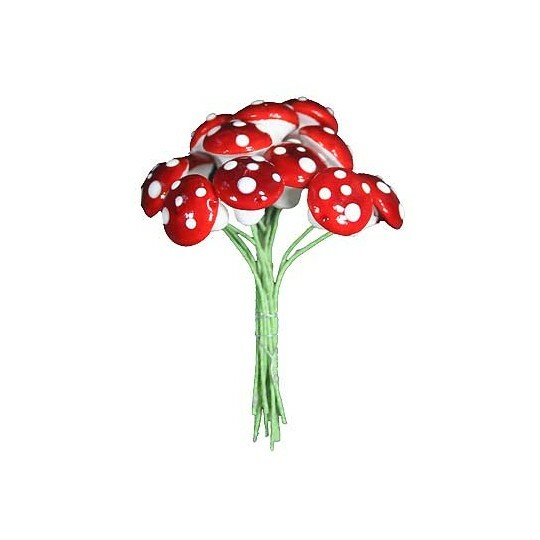 8 spun cotton mushrooms with glossy red lacquered caps and handpainted white spots. 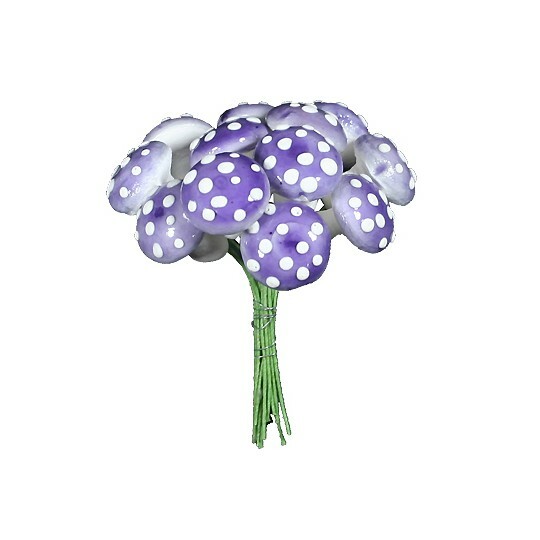 Each mushroom measures 20 mm high which is just under 7/8". They measure 3/4" across the cap and have a 3" green paper covered wire stem. Made in Germany. 6 spun cotton mushrooms with glossy red lacquered caps and handpainted white spots. 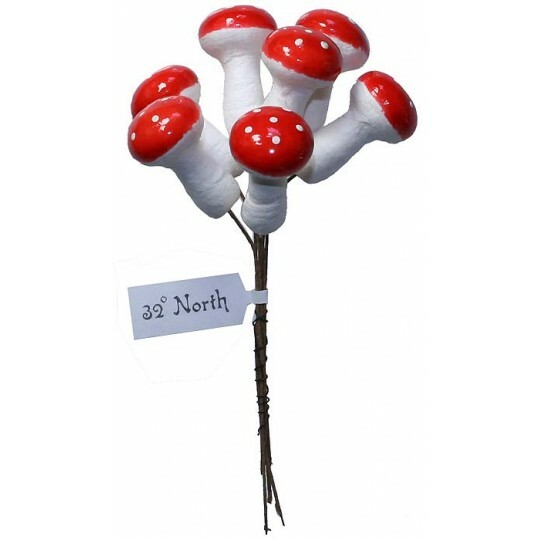 Each mushroom measures 25 mm high which is approximately 1". They measure just under 1" across the cap and have a 3" green paper covered wire stem. Made in Germany. 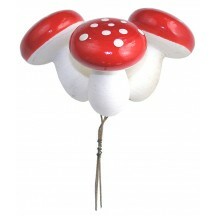 1 spun cotton woodland mushroom with a glossy red lacquered cap with white spots. Measures approx. 3.25" tall and 2.75" across the cap, does not have a wire stem. Made in the Czech Republic. 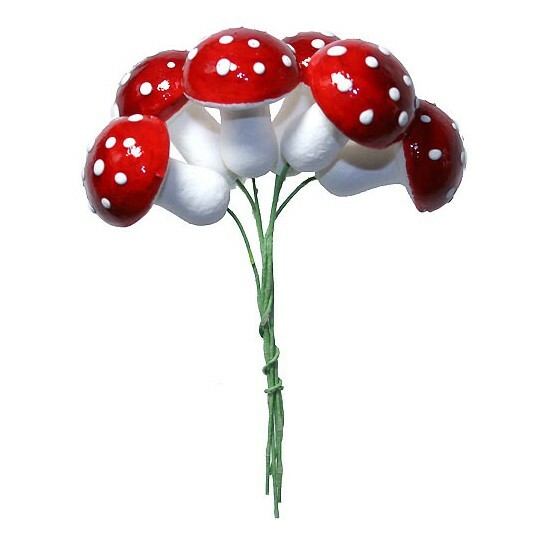 3 spun cotton woodland mushrooms with glossy red lacquered caps with white spots. Each measures approx. 2.25" tall and 1.75" across the cap on a 3" brown paper covered wire. Made in the Czech Republic. 7 spun cotton woodland mushrooms with glossy red lacquered caps with white spots. Each measures approx. 1 3/8" tall and 1" across the cap on a 3" brown paper covered wire. Made in the Czech Republic. 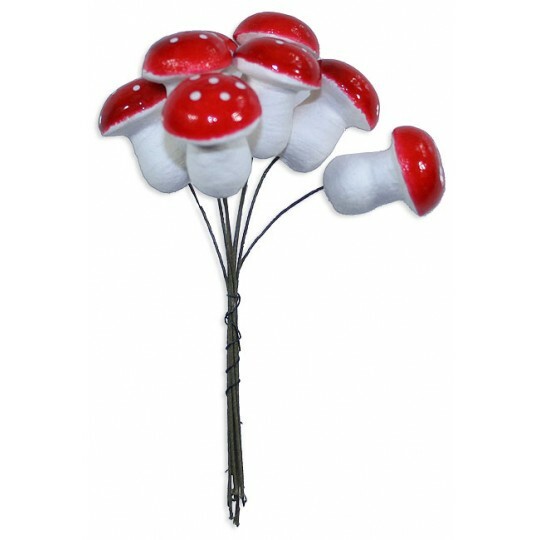 7 spun cotton woodland mushrooms with glossy red lacquered caps with white spots. Each measures approx. 1 3/8" tall and 3/4" across the cap on a 3 1/2" brown paper covered wire. Made in the Czech Republic. 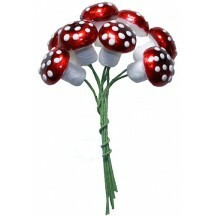 8 spun cotton woodland mushrooms with glossy red lacquered caps with white spots. Each measures approx. 1" tall and 3/4" across the cap on a 3" brown paper covered wire. Made in the Czech Republic. 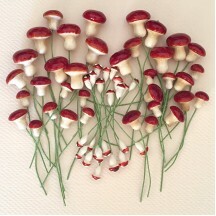 10 spun cotton woodland mushrooms with glossy red lacquered caps with white spots. Each measures approx. 3/8" tall and 1/4" across the cap on a 3" brown paper covered wire. Made in the Czech Republic. 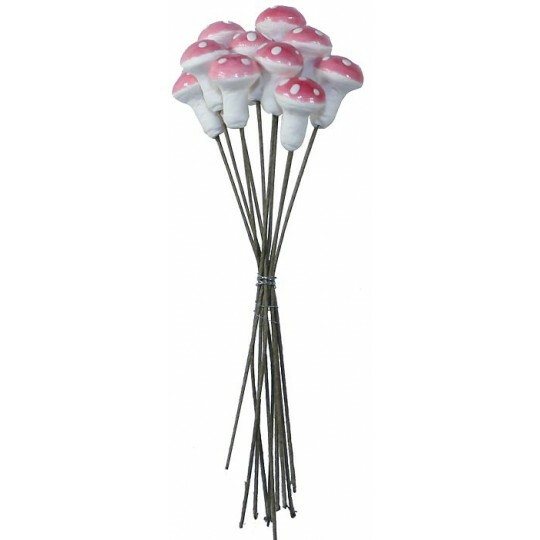 10 spun cotton woodland mushrooms with glossy pink lacquered caps with white spots. Each measures approx. 5/8" tall and 1/2" across the cap on a 4 1/2" brown paper covered wire. Made in the Czech Republic. 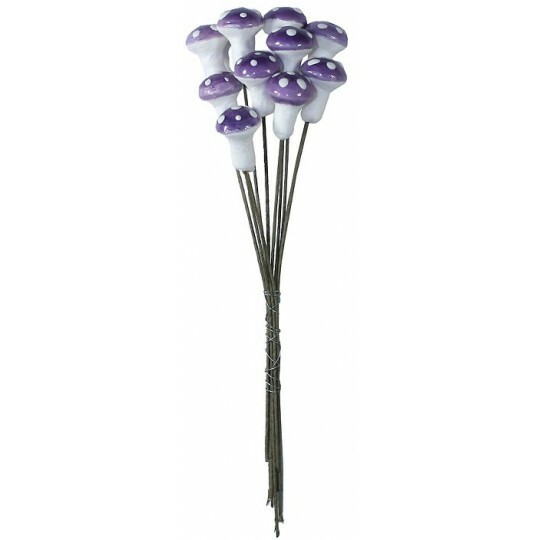 10 spun cotton woodland mushrooms with glossy purple lacquered caps with white spots. Each measures approx. 5/8" tall and 1/2" across the cap on a 4 1/2" brown paper covered wire. Made in the Czech Republic. 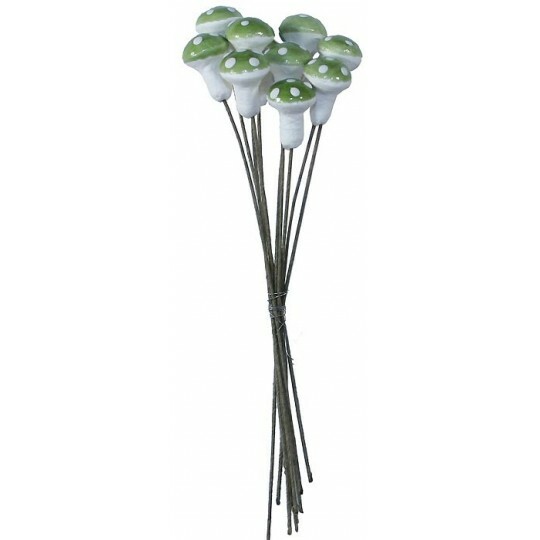 10 spun cotton woodland mushrooms with glossy green lacquered caps with white spots. Each measures approx. 5/8" tall and 1/2" across the cap on a 4 1/2" brown paper covered wire. Made in the Czech Republic.